I have decided to join in with the Siblings Project which is a challenge to photograph your children together once a month. As you may notice on here and across my social media there is definitely more pictures of Ruby. This is probably because I spend so much more time with Ruby than Hannah, especially as we only get 2 weekends a month with Hannah too. I am hoping this will encourage me to take more pictures of the two of them together and will be a good way for the girls to look back on how their relationship developed. 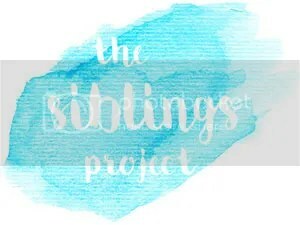 So Hannah has been a big sister for a whole 10 months by the time I have joined the party on the Siblings Project. Considering she had been an only child for nearly 7 years by the time Ruby arrived, she has adapted well and claims that she loves being a big sister. Ruby has definitely got more fun this month now she can walk and visits to the park and soft play have become a bit more interesting for Hannah as she can actually play with her. Hannah seems to be keen to have a ‘second Mum’ role to Ruby, encouraging her to walk, clap, talk, wave and just about anything else she can teach her to do! Ruby seems to really love following Hannah around and is interested in everything she says and does. She seems to learn so much from her and now she’s up on her feet the only way Hannah can get away from her is if she goes upstairs! As you can see from the following picture, she will even help herself to her food given half the chance!! Ruby is always super excited to see Hannah when she comes back from staying at her dads or from school. I just love seeing the looks Ruby gives her, she’s so affectionate when she wants to be!! So that’s it for this Month. I wonder what photos I will manage to get next Month? Next > No Room For a Play Room?